Defendants Keith Sandy, a former Albuquerque Police Department detective, left, and Dominique Perez, right, a former Repeat Offender Project officer and, former Albuquerque police officer and SWAT member are seen in court on Tuesday in Albuquerque. Sandy and Perez are charged with the 2014 fatal shooting of James Boyd, a homeless man who was armed with two pocket knives. Defense attorneys argue that Boyd, who was mentally ill and had history of violence against law enforcement, was a threat. ALBUQUERQUE – Prosecutors have said Albuquerque police overreacted in 2014 when they responded to a complaint about a homeless man camping in the foothills bordering the city. They blamed what they described as a paramilitary response for the deadly outcome of the standoff with James Boyd, a mentally ill man who had a history of violence against law enforcement officers. Defense attorneys say now-retired Detective Keith Sandy and former Officer Dominique Perez, both charged with second-degree murder, were doing their jobs – protecting fellow officers who they believed were in danger. Boyd had two pocket knives. 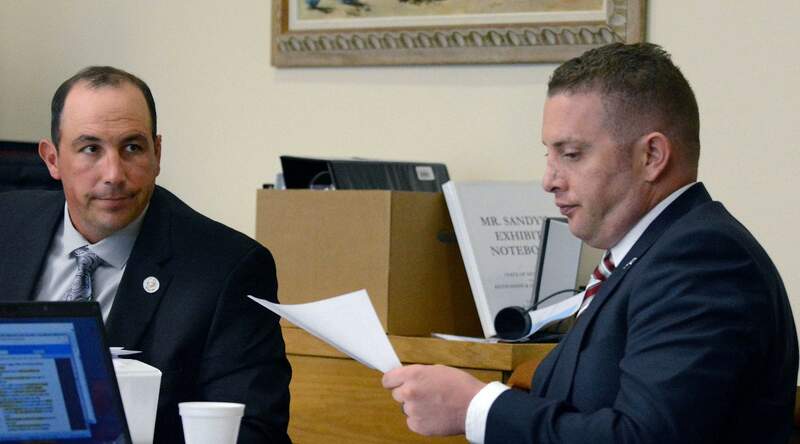 Albuquerque Police Detective Geoffrey Stone took the stand Wednesday in the trial of the two former officers and painted a picture for jurors based on the details he amassed during his review of the incident. The gearJurors were shown images of the defendants in police vests and tactical gear as Stone testified. The photographs were taken on the night of March, 16, 2014, after they fatally shot James Boyd, ending an hourslong standoff captured on police video. Both officers had rifles on them and handguns on their sides. Sandy wore a tactical vest over his sweatshirt; he was a detective in a plain-clothes unit. Perez, an officer in the SWAT unit, was required to wear clothing somewhat similar to that of a soldier. The situationIn police video played for jurors, Boyd is seen wearing a sweatshirt as he stands atop a hillside, resisting calls from officers to drop his knives and walk down the slope with them. As darkness falls, it appears he might surrender before a flash-bang grenade goes off, a K-9 unit approaches him, and he pulls out the two knives. Video from Perez’s helmet camera shows he was shot seconds later. The incident later sparked protests in Albuquerque during a period of nationwide attention to excessive use of force by police . The videoPerez’s camera and one mounted beneath Sandy’s badge were pointed out in court Wednesday as photographs of each of them were projected onto a large television screen. Video from Sandy’s camera was not part of the investigation. His attorney said previously that it failed to record that day.